I'm no Van Gogh, Matisse, or Hemingway; but falling into the marketing ploy of Moleskine note books I do indeed write a lot more now than I did on scraps of paper. 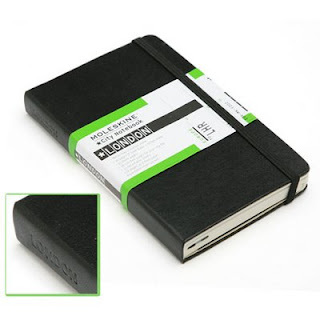 I've been hooked on Moleskine note books for taking wine and food notes, jotting down phone numbers and addresses in style, and creating mind map sketches on the fly. In the last three years with a lot more international travel I've become an advocate for the Moleskine city notebooks. I use my London, Barcelona, and Hong Kong city notes whenever traveling to those cities. 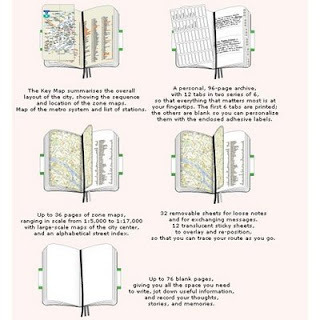 These 9 by 14 cm (3.5 x 5.5 inches) moleskine (oil clothed cardboard) notebooks with elasticised closure have 228 pages, three different coloured ribbon place markers, along with 44 pages of coloured street and transit maps. There are 12 tabbed sections: "Food: Places, legends, recipes", "Drinks: Bars, wineries, stories", "Sleep: Places, dreams, adventures", "People: Names, faces, encounters", "Info: shopping, art", and "Books, movies, music." along with 6 custom tabs to suit your lifestyle. City notes are great for preserving trip memories i.e. favourite bars, restaurants, hotels, sights, people, and shopping; along with detailed maps for the main downtown zones with the all important aphabetically listed street index. Twelve translucent sticky and re-positionable tracing sheets for retracing your favourite city walk abouts are lifesavers especially in cities like Barcelona. There's space for your travel itinerary planning and an accordion pocket in the rear to hold stamps, local lottery tickets and business cards. There are also 32 removal perforated squares for trading notes or phone numbers and 76 blanc pages for notes and sketches.